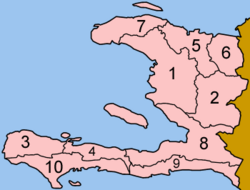 Haiti (Haïti in French; Ayiti in Haitian Creole; Hayti in nineteenth century English), officially the Republic of Haiti, occupies one-third of the Caribbean island of Hispaniola, and also includes many smaller islands such as La Gonâve, La Tortue ( Tortuga), Les Cayemites, Île de Anacaona, and La Grande Caye. The uninhabited island of Navasse is claimed both by Haiti and the United States. Haiti shares the island of Hispaniola with the Dominican Republic. The total area of Haiti is 27,750 km² (10,714 sq mi) and its capital is Port-au-Prince. A former French colony, Haiti was to become the first independent black republic, and the only nation ever to have formed from a successful slave revolt. Haiti became the second non-native country in the Americas (after the United States) when it declared its independence on January 1, 1804. Haiti has recently undergone a state of transition following an uprising, which forced President Jean-Bertrand Aristide to resign on February 29, 2004. He had been re-elected in 2000 in an election which several parties boycotted due to disputes with the vote-counting of a previous parliamentary election. René Préval was elected president in his place on February 7, 2006, and took office in May. The island of Hispaniola, of which Haiti occupies the western third, was originally inhabited by Taíno and Arawak. On December 5, 1492, the Santa Maria, captained by Christopher Columbus, ran aground on the present site of Môle Saint-Nicolas, Haiti, and claimed the island for Spain. Enslavement, harsh treatment of the natives, and especially epidemic diseases such as smallpox caused the Arawak and Taino population to plummet over the next quarter-century. In response, the Spanish began to import African slaves to search for gold on the island. Spanish interest in Haiti waned, however, after the 1520s, when vast reserves of gold and silver were discovered in Mexico and South America. Fearful of pirate attacks, the king of Spain in 1609 ordered all colonists on Haiti to move closer to the capital city, Santo Domingo. However, this resulted in British, Dutch and French pirates establishing bases on the island's abandoned northern and western coasts. French settlement of the island began in 1625, and in 1664 France formally claimed control of the western portion of the island. By the 1697 Treaty of Ryswick, Spain ceded the western third of Hispaniola to France. France named its new colony Saint-Domingue. While the Spanish side of the island was largely neglected, the French side prospered and became the richest colony in the Western Hemisphere, exporting large amounts of sugar and coffee. French colonial society contained three population groups: Europeans (about 32,000 in 1790) who held political and economic control; the gens de couleur, some 28,000 free blacks (about half of which had mulatto background) who faced second-class status; and the slaves, who numbered about 500,000. (Living outside French society were the maroons, escaped ex-slaves who formed their own settlements in the highlands.) At all times, a majority of slaves in the colony were African-born, as the very brutal conditions of slavery prevented the population from experiencing growth through natural increase. African cultures thus remained strong among slaves until the end of French rule. 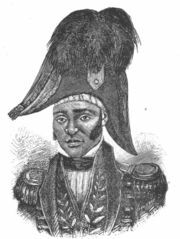 Jean Jacques Dessalines became Haiti's first emperor in 1804. Inspired by the French Revolution, the gens de couleur pressed the colonial government for expanded rights. In October 1790, 350 revolted against the government. On May 15, 1791, the French National Assembly granted political rights to all blacks and mulattoes who had been born free - but did not change the status quo regarding slavery. On August 22, 1791, slaves in the north rose against their masters near Cap-Français (now Cap-Haïtien). This revolution spread rapidly and came under the leadership of Toussaint L'Ouverture. He soon formed alliances with the gens de couleur and the maroons, whose rights had been revoked by the French government in retailiation for the uprising. 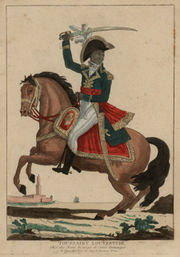 Toussaint's armies defeated the French colonial army, but then joined forces with it in 1794, following a decree by the revolutionary French government that abolished slavery. Under Toussaint's command, the Saint-Domingue army then defeated invading Spanish and British forces. This cooperation between Toussaint and French forces ended in 1802, however, when Napoleon sent a new invasion force designed to subdue the colony; many islanders suspected the army would also reimpose slavery. Napoleon's forces initially were successful at fighting their way onto the island, and persuaded Toussaint to a truce. He was then betrayed, captured and died in a French prison. This backfired on the French, as it motivated Jean-Jacques Dessalines and Henri Christophe, leaders of separate military factions, to resume the rebellion. Napoleon's forces were further troubled by a yellow fever epidemic that swept through the island. Dessalines's army defeated the French forces at the Battle of Vertières on November 18, 1803. On January 1, 1804 the nation declared its independence, securing its position as the second independent country in the New World, and the only successful slave rebellion in world history. Dessalines was its first ruler. The name Haiti was chosen in recognition of the old Arawak name for the island, Ayiti. The new State of Haiti supported the abolitionist cause wherever possible. Haiti aided Simón Bolívar, allowing him refuge and supporting his revolutionary efforts under the condition he free Latin America's slaves. The slaveholding powers surrounding Haiti isolated the new nation under a cordon sanitaire, fearing slave revolutions of their own. The Haitian Revolution is thought to have inspired numerous slave revolts in the Caribbean and United States. The blockade was virtually total. The Vatican withdrew its priests from Haiti and did not return them until 1860. France refused to recognize Haiti's independence until it agreed to pay an indemnity of 150 million francs, to compensate for the losses of French planters in the revolutions, in 1833. Payment of this indemnity brought the government deeply in debt and crippled the country's economy. In 1806, Dessalines, by now Emperor, was murdered in a power struggle with political rivals who thought him a tyrant. The nation divided into two parts, a southern republic founded by Alexandre Pétion (mulatto), becoming the first black-led republic in the world and the first Caribbean state to achieve independence while the north became a kingdom under Henri Christophe. The idea of liberty in the southern republic was as license, a fondness for idleness shared by elite and peasant. Christophe believed that liberty was the opportunity to show the world that a black nation might be equal, if not better than the white nations. Consequently he worked the field hands under the same unrelenting military system he developed under Toussaint. He also built for himself eight palaces including his capital Sans Souci and the massive Citadelle Laferrière, the largest fortress in the Western hemisphere. In August 1820, King Henri I (Henri Christophe) suffered a stroke that left him partially paralyzed. When the news spread of his infirmities, the whispers of rebellion, deceit and treachery began. On October 2, 1820, the military garrison at St. Marc led a mutiny that sparked a revolt. The mutiny prempted a conspiracy of some of Christophe's most loyal generals. Some of his trusted aides took him from the palace of Sans-Souci up to his Citadel, to await the inevitable confrontation with the rebels. Christophe ordered his attendants to dress him in his formal military uniform and for two days desperately tried to raise the strength to lead out his troops. Finally, from the desk he barked and snarled orders in these last days and finally ordered his doctor to leave the room. Shortly after he left, Christophe raised his pistol and shot himself dead through the heart. Following Christophe's death the nation was reunited as the Republic of Haiti under Jean-Pierre Boyer, Petion's successor. Boyer invaded the Spanish colony of Santo Domingo and united the entire island of Hispaniola under Haitian rule until 1844 when the Dominican Republic obtained its independence. Throughout the nineteenth century, the country was ruled by a series of presidents, most of whom remained in office only briefly. Meanwhile, the country's economy was gradually dominated by foreigners, particularly from Germany. Concerned about German influence, and disturbed by the hanging of President Guillaume Sam by an enraged crowd, the United States invaded and occupied Haiti in 1915. The United States imposed a constitution (written by future president Franklin D. Roosevelt) and applied an old system of compulsory corvée labor to everyone. Previously this system had been applied only to members of the poor, black majority. The occupation had many long-lasting effects on the country. United States forces built schools, roads and hospitals, and launched a campaign that eradicated yellow fever from the island. As their occupation resulted in the centralization of government and industry from the provinces to the capital, destroying the socio-economic fabric of the country and launching an exodus from the countryside, some nationalist rebels, called the Cacos, waged a strong guerilla warfare, headed by Charlemagne Péralte and later Dominique Batraville. As a consequence, the U.S.-controlled government created a National Guard which in future decades would become the Armée d'Haiti and be said to commit many atrocities against its own people. The occupation was ended in 1934. The Americans left Haiti in the hands of the mulatto minority, but in 1946 Dumarsais Estimé became the country's first black president since the American occupation began. His efforts at reform sparked disorder, and when he attempted to extend his term of office in 1950 (as most previous presidents had done) there was a coup, followed by the second formal Military Council of Government led by Paul Magloire. In 1957, Dr. François Duvalier ("Papa Doc") came to power in the country's first universal suffrage election; many believed this outcome was manipulated by the army. In 1964, he declared himself president for life. Duvalier maintained control over the population through his secret police organization, the Volunteers for National Security - nicknamed the Tonton Macoutes ("bogeymen") after a folkloric villain. This organization drew international criticism for its harsh treatment of political adversaries, both real and suspected. Upon Duvalier's death in 1971, he was succeeded by his 19-year-old son Jean-Claude Duvalier (nicknamed "Baby Doc") as Haiti's new president for life. The younger Duvalier regime became notorious for corruption, and was deposed in 1986, ushering in a new period of upheaval. The unravelling of the Duvalier regime began with a popular movement supported by the local church and set in motion by the visit of Pope John Paul II in 1983, who before embarking his plane gave a rousing speech ending with an angry exclamation: "Things must change here!" In 1984, anti-government riots broke out throughout the nation and the Haitian Catholic Bishops' Conference initiated a literacy program designed to prepare the Haitian public for participation in the electoral process. The charismatic black leader Jean-Bertrand Aristide was elected president in 1991, but was deposed in a coup shortly after. There followed three years of brutal control by a military junta led by Raoul Cedras, before a second American invasion and occupation in 1994 returned Aristide to power. One of the first acts of the re-installed government of Aristide was to disband the army, to great popular acclaim. Aristide was succeeded by a close ally and former prime minister, René Préval, in 1996. While Aristide was the first democratically elected president in Haitian history, Préval's administration was most notable for the fact that he was the first person in Haiti's history to constitutionally succeed a president and then serve a complete term, leaving office voluntarily at the prescribed time. Every previous president had either died in office, been assassinated, been deposed, overstayed his prescribed term, or been installed by a foreign power. Aristide returned to office in 2001 after elections that were boycotted by many of his opponents, who accused his party, Fanmi Lavalas, of counting votes improperly in a previous senatorial election, as well as threatening critics. Aristide denied the charges and accused his opponents of accepting U.S. assistance, and plotting to overthrow his government. The opposition mostly denied this, but many of its members continually called for his early resignation. In February 2004, the Aristide government was overthrown by armed rebels, consisting mostly of paramilitary groups led by ex-U.S. Special Forces agent Guy Philippe. These armed opponents were alleged to be allied with the political opposition. As Aristide departed the country, many members of his government fled or went into hiding, and the United States again sent Marines into Port-au-Prince. After Aristide's departure, Supreme Court Chief Justice Boniface Alexandre succeeded to the presidency appointed by a council of elders and supported by the United States, Canada, and France. In the months following the February Coup, the country was engulfed into violence between the interim government's forces and Lavalas supporters, and many members of the Lavalas party were sent to jail, exiled, or killed. Much of the violence began after police of the interim force began shooting at peaceful Lavalas demonstrations in mid 2004. Over 10,000 workers in Haitian civil enterprises lost their jobs following the coup. A study published in the British medical journal "The Lancet" found through single spatial sampling that 8,000 murders and 35,000 sexual assaults occured in the great Port-au-Prince area during the period of the interim regime. Elections were held in February 2006, and René Préval was again elected president. Preval has promised to bring peace and stability to the country. See Haitian elections, 2006. Politics of Haiti takes place in a framework of a presidential republic, and of a pluriform multi-party system, whereby the President of Haiti is the head of state, while the Prime Minister is head of government. Executive power is exercised by the government. Legislative power is vested in both the government and the two chambers of the National Assembly of Haïti. Each department is divided into from three to seven arrondissements, and the arrondissements are further divided into communes. Haiti's terrain consists mainly of rugged mountains with small coastal plains and river valleys. The east and central part is a large elevated plateau. The highest point in Haiti is Chaine de la Selle at 2,680 m (8,793 feet). The 360-km (224- mile) border is shared with the Dominican Republic. In 1925, Haiti was a lush tropical paradise, with 60% of its original forest covering the lands and mountainous regions. Since then, the population has cut down all but 2% of its forest cover, and in the process has destroyed fertile farmland soils while contributing to desertification. Erosion has been severe in the mountainous areas. Pictures from space glaringly show the stark difference in forestation between Haiti and the neighboring Dominican Republic. Most Haitian logging is done to produce charcoal, the country's chief source of fuel. The plight of Haiti's forests has attracted international attention and has led to numerous reforestation efforts, but these have met with little success to date. In addition to soil erosion, the deforestation has also caused periodic flooding, as seen on September 17, 2004. Tropical storm Jeanne skimmed the north coast of Haiti leaving 3,006 people dead in flooding and mudslides, mostly in the city of Gonaïves. There has been a dispute between the United States and Haiti about Navassa Island (Navasse), which both countries claim. The Haitian claim relies on documentation that Navassa became part of Haiti after a 1697 agreement between France and Spain that gave France the western third of Hispaniola plus nearby islands, including Navassa Island. The United States claims the island pursuant to its own Guano Islands Act of 1856. Haiti remains the least-developed country in the Western Hemisphere and one of the poorest in the world. Comparative social and economic indicators show Haiti falling behind other low-income developing countries (particularly in the hemisphere) since the 1980s. Haiti now ranks 153rd of 177 countries in the UN’s Human Development Index. About 80% of the population lives in abject poverty, ranking the country second-to-last in the world for that metric. Nearly 70% of all Haitians depend on the agriculture sector, which consists mainly of small-scale subsistence farming. The country has experienced little formal job creation over the past decade, although the informal economy is growing. Under the second Aristide administration and the Alexandre-Latortue administration, difficulty in reaching agreements with international sponsors denied Haiti badly needed budget and development assistance. In addition to these geopolitical obstacles, another major impediment to development during the last 20 years has been the repeated episodes of violence that have rocked the country. While there was relative calm under the governments of Fanmi Lavalas, this may not have been sufficiently long-lived to convince foreign investors to commit significant capital to Haiti. Consequently, the country has experienced shortages, severe trade deficits, and periodic high inflation during this 20-year period. Reports have suggested that most of Haiti's flow of foreign reserves, during at least the last five years, has come from a combination of remittances from the sizeable expatriate community and taxes on incoming phone calls. Although Haiti averages about 293 people per km² (758 people/sq mi), its population is concentrated most heavily in urban areas, coastal plains, and valleys. About 90% of Haitians are of predominant African descent. The rest of the population is mostly mulatto, mestizo, or mixed Caucasian-African, and Amerindian-African ancestry. A few are of European or Levantine heritage. Despite the predominance of African ancestry, Taino bloodlines are argued to be present in a rather modest percentage of the population, with mixed-raced Haitians also claiming this. There are Haitians who are also od dominican descent. 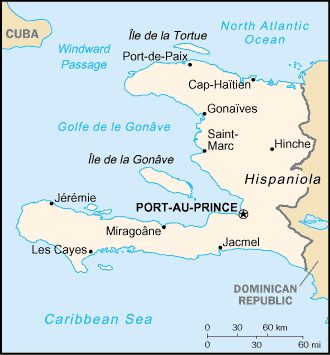 Haiti's official languages are French and Haitian Creole, however, Spanish is spoken near the border due to the proximity of the Dominican Republic and is increasingly being spoken westward from the border as Dominican and Cuban trade influence Haitian affairs.